Our guest this episode is Garrett Chaussard, who is the director of Instruction at Skokie Country Club and winner of the 2018 Illinois PGA Match Play Championship at Kemper Lakes. 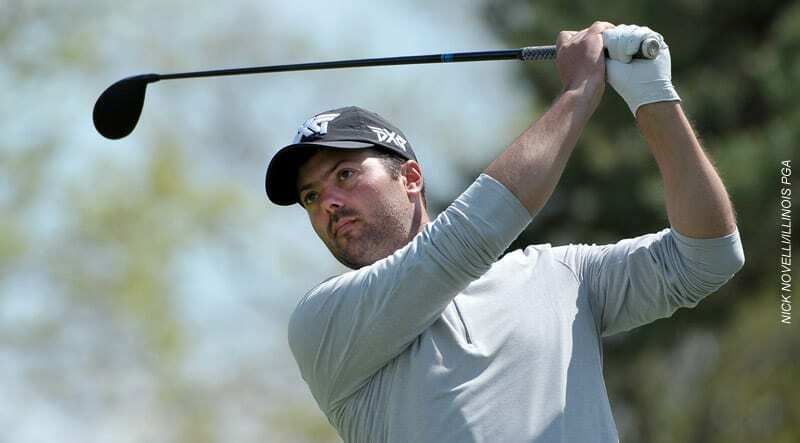 Prior to teaching, Garrett played golf at the University of Illinois and competed on the PGA Tour of Canada. CHICAGO GOLF REPORT:	How did you initially find the game of golf? GARRETT CHAUSSARD:	I grew up in Northern California and my dad was a weekend golfer and got me into the game at a very young age. I was four years old, and for a brief time my dad worked part-time at a driving range, so he could hit golf balls and I did as well. I ended up hitting a lot of golf balls when I was younger and really sort of fell in love with it from there. That progressed into me becoming a competitive junior player, then got good enough to earn a D1 scholarship at the University of Illinois. I was in Mike Small’s first recruiting class back in 2001. I had a solid career at Illinois, and then I tried to play full-time for a while and had some small successes here and there. One big highlight was qualifying for the US Open in 2008. Playing professional golf is difficult and I didn’t have as much success as I needed, so that sort of evolved into a teaching role and that was about the time I hooked up with Kevin Weeks at Cog Hill, who helped get me started. I kind of interned for him for a summer, just setting up clinics and watching him give his lessons indoor and out. I spent that winter at lot of the time behind a computer in his putting lab in the bar at Cog Hill and progressed through there and started giving my own lessons. I continued the learning process of just continually get better at teaching and learning more about the game. My goal was always to play in the PGA Tour and I did not achieve that goal. Something I always search for is more reasons of why that might have been the case. So I do a lot of studying now, and really taking that education seriously is one of the main things that I learned through Kevin and Doc Suttie at Cog Hill. I’m continuing to learn and that progresses eventually to working at Chicago Highlands Club for a couple of years as Director of Instruction and now I’m at Skokie Country Club in Glencoe. CHICAGO GOLF REPORT:	We recently interviewed Mike Small, and it became very apparent why he’s been so successful, not only as a player but as a coach because he’s intensely focused and driven. What was it like to play under Mike Small and I’m sure the Illinois program was a lot different then than it is now? GARRETT CHAUSSARD:	Yeah, it was a lot different then. When Coach had taken over his first year prior to me getting there, I would say the program was not in a great place then, very much bottom of the Big 10. Then our recruiting class came in and we kind of shot up. We finished second in the Big 10 Championships that year, got to the Nationals and actually led Nationals my freshman year through the first round, with three freshmen, a sophomore and a junior, so very young. We kind of turned it around quickly, or at least got started in the right direction. I think the biggest focus at the time was, and as you can probably imagine from Coach Small, your goals are very focused on golf. There are all the other distractions of college and everything else. We were a much more focused group. I think that was obviously one of the reasons Coach recruited us because our goals were to play at the next level, so we took our golf very seriously. It wasn’t just going out to play. There were some serious goals post college for all of us that he recruited, and that’s I think one of the major tenants that he still holds to this day. I think we started to change the culture towards that and he’s obviously been able to continue at it and really build it to one of the best college programs in the country. CHICAGO GOLF REPORT:	Do you get to stay in contact with other alumni? GARRETT CHAUSSARD:	We have our alumni match after the PGA show in February. It’s also fun to catch up with some of the current guys. It’s fun to reconnect make new relationships. I do know a couple of kids they have on the team now. I’ve played a little bit with Brendan O’Reilly who is currently there. We keep in touch and Coach still plays competitively in some of the events, and I tend to see him at the Illinois Open, our section championship and some other events and we keep in touch too. The network of Illinois alums is large, and Coach is doing a good job now of keeping us connected a bit better. CHICAGO GOLF REPORT:	Obviously Coach Mike Small is a big influence in terms of a mentor and player. You also have other mentors as well. You mentioned Kevin Weeks, Doc Suttie, those are big names, especially here locally and certainly nationally. How have they impacted your career as you’ve evolved now into an instructor? I thought that was quite interesting for somebody who knows as much about biomechanics and how it applies to golf, to still be continually learning. And what I saw through him at Cog Hill, integrating technology and all this new stuff that he really likes. Even more so with Kevin Weeks and his putting research that I was very closely involved in at the time, which was great. I was allowed to question, what is in the future and are the new ways and better ways of doing things? I think that’s a major influence on why I spend a lot of time trying to talk to smart people in our business and try to stay on the cutting edge of all the technology and everything that’s out there. CHICAGO GOLF REPORT:	With your role at Skokie Country Club what type of players do you work with? I know that you are heavily involved with junior golf, do you tend to focus on a specific area? GARRETT CHAUSSARD:	With this role, I hit every conceivable portion of the golfing population really. I do still teach some beginners. Not many, but I’ve got a few that are getting into the game. Most of them are on the junior side, but I have some adults that are less experienced. The large majority of my students are regular member lessons with people that have been playing golf for a long time. And then the other major component is our junior development. Where I spend most of my time is competitive player environment of training. The high school players or potentially college players, helping them develop their game to the point where they can play in tournaments and succeed, and achieve any goals that they have set for themselves. I’ve got a nice group at the club of about eight to 12 kids depending on the time of the year, that are really serious about the game. It’s something that we are going to continue to grow through what we do with our younger developmental kids as well. So that’s where a lot of my time is spent, but I hit everybody. I hit the whole spectrum for sure. CHICAGO GOLF REPORT:	Recently you were at Chicago Highlands and now you’re at Skokie Country Club. Can you talk a little bit about the difference between working at a fairly new course versus one that is so historic like Skokie? GARRETT CHAUSSARD:	It’s a different environment. It’s a different membership at Highlands – younger and a ton of kids, just a massive number of kids. I’d say well shoot, conservatively in the entire junior program at Highlands, there is well over 75 kids from top to bottom at the club just because the demographics have kids in that age group, and a more non-traditional type of golf course. It’s really a growing club, so obviously Skokie here is a much more established, and we don’t have as many junior golfers as Highlands, which is probably the major difference. But outside of that it’s a different environment of clubs and it’s more traditional and a little more buttoned up than Highlands was. Definitely a different environment, but a really fun one to. Everybody takes their golf quite serious here, and it’s fun when you are teaching people that care about their games and work on it. And that’s what you want to coach the students that are really motivated to get better and put some time in, so it’s been great. CHICAGO GOLF REPORT:	What motivates you as an instructor? You mentioned biomechanics. Are there any specific areas of technology or anything that you get involved with that really excites you? GARRETT CHAUSSARD:	Right now, I’m focused probably mostly on the brain, and how people learn. That’s where I get fascinated. The different strategies that people come with to learn golf. I really like to read a lot about how that process is put together. There are a lot of pieces to the puzzle of how to put together a golf swing, and then progressed that up to put the entire game together. I’m trying to come up with creative ways to help all people find their way and kind of learn their own solutions to the game. Maybe me not dictating quite as much of exactly what I think they should do. But kind of manipulating the environment, so that helps their brain react in a certain way and make the changes they might need to make. That’s where I currently go to, and then all the technology besides that. The one thing with the brain that is limited these days is it’s really a difficult thing to measure. We measure ball flight, we can measure ground reaction force. We can 3-D measure the body. We don’t really have a great handle on how to measure the brain. But that’s where a lot of my interest is in learning about the brain and helping people learn things is really fun to me. CHICAGO GOLF REPORT:	Is there a common misconception or something for the average amateur golfer to help them improve their capabilities to mentally play the game of golf? GARRETT CHAUSSARD:	What I find with most adult lessons is that most of the lessons are stripping away concepts that are not helping that person. If a lesson has gone well, they probably asked the right questions and received some answers to help them interpret what they need to do. I would say for most people, maybe the largest thing that I find is people just don’t know where they’ve hit it on the club face. They think they know. However, they don’t know where they’ve struck the ball on the club face. I have students every week, especially newer students, where I’ll basically test their ability to identify where they’ve struck it on the club face. Because if you think you’ve hit it on the toe, but you’ve actually hit it on the heel, there’s no likely chance you’re able to make the proper correction to what you need. Your impression or your intention of what you’re going to change is not likely to be correct. Aligning what you’re trying to accomplish with the intention I think is really important. A lot of my lessons end up with those fundamental steps and we don’t have to get into a lot of heavy detail on how to do things differently. Are you aware of where you’re hitting on the club face, aware of where the club is hitting the ground? Simple awareness things that I think we get too far away from with a lot of the technology and the way we measure everything. All good players know where they hit on the club face. All good players have skill of striking the ground in the right spot. Those two basic things – if you’re aware and have the right feedback – can really help you improve if you’re struggling, especially with ball striking. CHICAGO GOLF REPORT:	What is your approach to goal setting for an average player? Is it different for juniors or for more advanced player? GARRETT CHAUSSARD:	We can look at it a couple of ways. One of the creative ways that I like is to set goals that actually make mini games out of instruction, or little tasks that I challenge players to do. And this could be for any skill level. That could be a micro goal within a lesson. For example, we need to accomplish this a certain number of times or relay the feedback correctly a certain number of times. Little mini-goals like that where you make your improvement more game-like, can really help. With juniors, competitive players, they have more outcome goals. A lot of the times it’s keeping them within some process goals, like taking care of the steps along the way. That’s where I think the similar concepts can apply. Where we have some short term and intermediate goals, making sure that they are practicing with some focus. Because so many of them, they want the goal. We want to go and play in big tournaments, they want to shoot under par for whatever it is. They want to make the high school team but we need to take care of the details leading up to that. Goals for regular players is a harder one. It’s very individual. I think most people want to shoot the best score they have ever shot. If we can help them get their peak performance to a point where they’re better than they were before, I think a lot of them are happy with that goal, where they have actually lowered their best score or where they have pitched a personal best. That’s something you know, they’re going to remember forever until they break it again. For those little intermediate goals, I do a lot of the game-based approach to instruction and practice, so everything has a little bit of a mini goal. Then we may have some larger goals that we set out depending on what the players’ long-term goals might be. That’s a general overview of the goal setting process for me. CHICAGO GOLF REPORT:	What are the courses in the Chicagoland area different courses that you really enjoy playing and visiting, either public or private? GARRETT CHAUSSARD:	I’m probably very traditional. Skokie Country Club is one of my favorites and it was before I started working here. Chicago Golf Club was great. The one time I’ve gotten to play out there, I loved Shoreacres. I really enjoy Course Two at Cog Hill. It’s really fun and also you can make a lot of birdies out there and that’s fun to. Beverly Country Club on the south side is a great place to play. Growing up in Northern California, I played places like Olympic Club, Meadow Club, a lot of the Alister MacKenzie golf courses around the West Coast where I grew up. I was able to play at Pebble Beach and Spyglass, so I think more of that traditional style I really like. There’s a ton of places in Chicago that have some of that same feel.